Nestled within the hustle and bustle of the city streets is a place where fabulousness and glamour is manifested from the drag queen beauties who create the all-around sensationalism that is Lips ATL. Lips began in New York and prospered there for two decades until it was decided to begin the adventure down south in Atlanta September 2013. There were other locations in California and Florida built as well, and currently there is work on a Chicago location for next year. 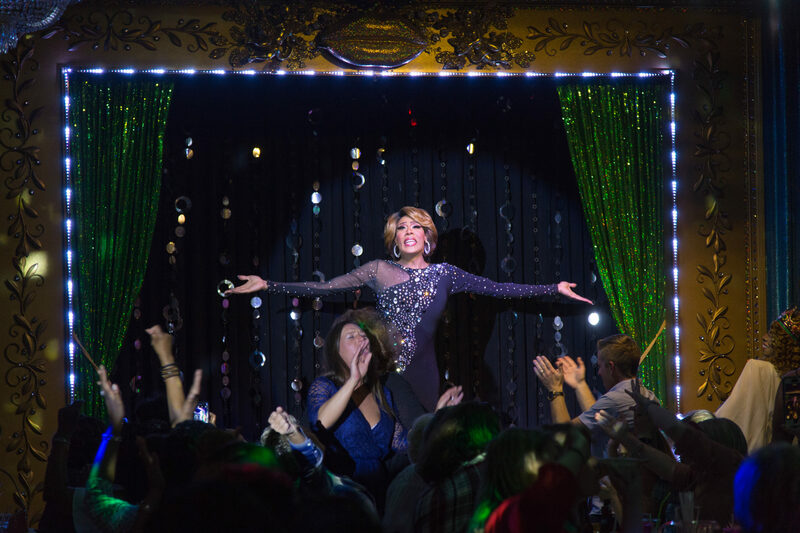 Lips ATL – Drag Queen Show Palace, Restaurant & Bar is the only one of its kind here in the southern concrete jungle. It is the only place to catch a impersonation performance of diva idols like Madonna, Cher, Gaga and Whitney, and where one can see the elaborate looks the queens are working. The atmosphere of the palace is a pure spectacle. Everything about it is presented in an extravagant manner, nothing is held back and everything is doused in glitter and mania. The drag queens trace around confidently, and give visitors an experience that will be engraved in their minds as an incomparable moment. It’s all about giving the audience a never-before-seen show that will leave them feeling their inner divas. Owner of Lips, Mark Zschieschd (Drag queen persona is Yvonne Lamé) shared why he thought a place like Lips was necessary to create. The first thing that one notices when entering the palace is the indulgence of razzle-dazzle, it makes one think they walked through a portal, which made them leave the drab atmosphere of Atlanta behind and enter the intoxicating elements of this goddess wonderland. This feeling is heightened once the stage lights turn on, and extravagance takes the stage. “When we first started out we looked more like the Hard Rock Cafe of drag, with a ton of memorabilia on the wall, but then it kind of morphed into something else. It’s much more grand. All the waiters are in drag, and the front door hostess is as well. The decor is over-the-top, campy drag queen palace. So you have the wow factor of the decor, and then there’s a show because we are set up like a dinner theatre,” Zschieschd said. Lips aims to provide fantastical time for all the parties that are celebrated at their palace, and by giving some extra special attention to the bachelorette or birthday girl, that can be achieved. They provide anyone who has a birthday with a special crown or tiara, a birthday cake with a candle and finally, an opportunity to be the center of attention. “The interaction is that the show hostesses will banter with the guests and then if someone is celebrating a birthday or bachelorette party, then each individual is brought on stage and they have their 15 seconds or minutes of fame,” Zschieschd said. One of the shows that reins very popular with the crowd is the Gospel Brunch on Sundays, which is lead by drag queen Mother Bubba D.Licious. She leads the masses in a dragalicious praise of the Lord, but in an extremely new and imaginative approach. The palace includes a complete bar draped in glitter and reflective black marble tops, the middle is filled with long, stretched-out tables for the visitors to sit in a royal setting and the most appealing appendage is the stage, which is customized to transform into a spectrum of different mindblowing visuals. When the stage is set, the queens assemble. They give performances are modeled in a Las Vegas style fashion, and the women are dressed from idols from the 80s to the idols of today. The features of the establishment might bring the flashy elements to the forefront, but it’s the ladies that strut around the joint that really bring the captivating sparkle to new heights. This is achieved when the queens have developed their powerful personas after incorporating each alluring accessory needed to reach complete fabulousness. “As the drag queens get ready, some can do it in an hour and some take two hours. Obviously the thing that is most time consuming, and I think that’s the same for a woman is putting on the makeup. And obviously if you’re a an transforming into a woman, there’s an extra layer of everything you have to put on. Then they just have to put on the fabulous dress and plop on the hair and you’re there,” Zschieschd said. According to Zschieschd, it’s straight women who frequent the palace. They enjoy the fun, party-prone environment and adore the characters being displayed in front of them. Zschieschd said that when transforming to a drag queen, one needs to find their inner fire when completing the look. Wednesday: “Bitchy Bingo” is a chance to win prizes and they also host “Twisted Broadway,” which is where the hilariousness is taken up some notches. Thursday & Sunday Night: “Dinner with Divas” will be the chance to be surrounded by all the greatest divas throughout generations, like Gaga, Cher, Beyonce, Adele, etc. Friday & Saturday: “Glitz & Glam Las Vegas Style” is a chance for everyone to dress in striking clothing that look as though they come from sin city. Sunday Morning: “Gospel Brunch” is where the Sisters of Sequence are belting out gospel jams like Joyful Noise.